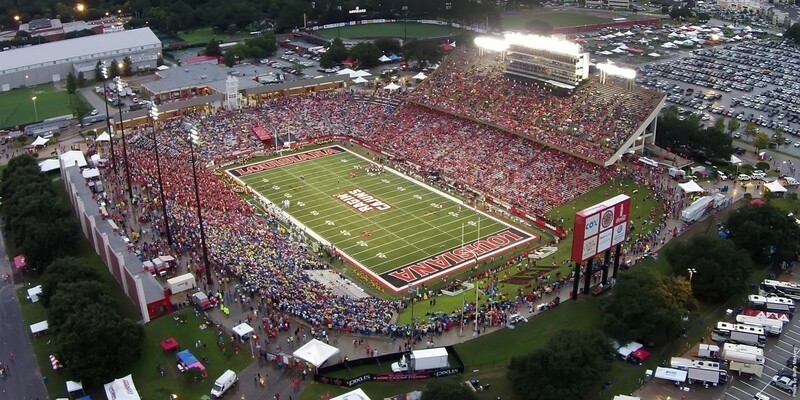 LAFAYETTE – When the Louisiana Ragin' Cajuns football team kicks off its 2017 season on Sept. 2 against Southeastern Louisiana, Cajun Field will feature a new artificial surface, Director of Athletics Bryan Maggard announced Monday. Maggard said that the current synthetic surface, which was installed before the 2008 season, will be replaced with Matrix Turf, the same surface at the Dallas Cowboys' AT&T Stadium. "The replacement of the Cajun Field turf is another step in upgrading our facilities while improving the overall experience for our student-athletes," Maggard said. "Additionally, it will allow us to host various types of events on the field and further enhance the game-day experience for our fans." Hellas Construction, based in Austin, Texas, is installing the new surface in early August. Removal of the existing turf will begin later this month. Matrix Turf is known for its longevity and performance. It is made with high-quality resins that are resilient, stable, and durable. "This is a much needed upgrade for Cajun Field," head football coach Mark Hudspeth said. "Our team really appreciates the university and athletics department for their continued effort to give our student-athletes the best resources in order to compete for championships."